The get-out-the-vote advocates were young, some no more than 11, but they relied on an old favorite in their effort to get people to the polls. 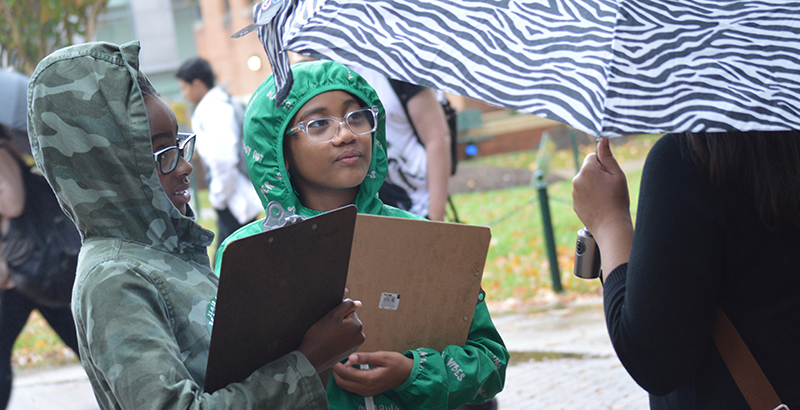 Way too young to vote themselves, these students — fifth-graders from Capital City Public Charter School and eighth-graders from E.L. Haynes Public Charter School, both in Washington, D.C. — spent a rainy Monday morning at George Mason University, where they practiced their skills at public polling and canvassing before leading the get-out-the-vote march across campus. “We’re just trying to help out to see if you vote,” said Amaya Leftwich, a fifth-grader at Capital City. School Safety Tops Young People’s List of Election Concerns. But Will It Lead Them to Vote? 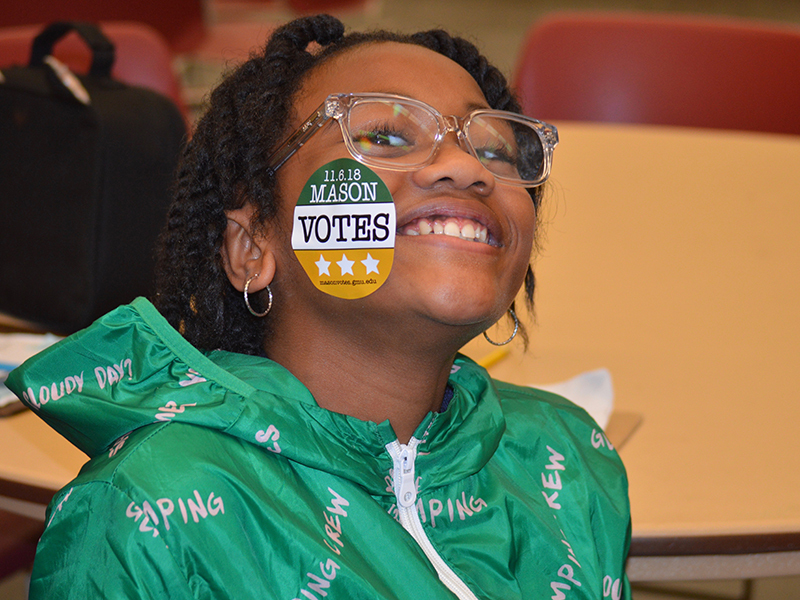 The students learned about the historically low voter turnout in midterm races, particularly among the youngest voters, said Sarah Cole, the fifth-grade humanities teacher at Capital City who organized the event. Most of the students’ signs appealing to would-be college voters focused on the importance of utilizing the right to vote, and on voting on behalf of those too young to do so themselves. “The U.S. needs to make a change,” said Promise Njoku, a Capital City student. In class, students have discussed Trump’s proposed border wall (Njoku and a group of girls with whom she made signs for the rally are not fans), a proposal to overturn the 2010 health care law, and tax bill that contained a provision allowing oil drilling in an Alaskan nature reserve. 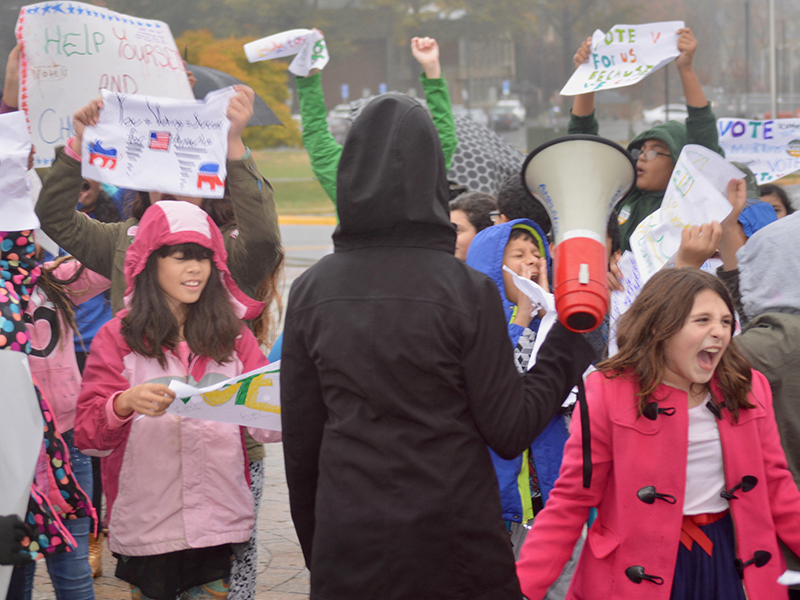 Before the march, the students braved a persistent drizzle to ask students passing between classes at George Mason whether they’re voting, and if they know all three branches of government. Some didn’t know the legislative branch, said fifth-grader Lyndze Jenkins. “It was like the younger kids were teaching the older kids,” she said. The D.C. students ended up at George Mason in part because Northern Virginia is the home to a tight race. The campus is part of Virginia’s 11th congressional district, currently represented by Democratic Rep. Gerald Connolly, but many students live in the 10th district, home to a close contest between sitting Republican Rep. Barbara Comstock and her Democratic challenger, Jennifer Wexton. “It’s a state where it really does matter that everyone is participating,” Cole said. The curriculum Capital City uses emphasizes project-based learning, with broad themes called “expeditions” every year and case studies for each expedition. In the past, that has meant, for instance, mock elections or participation in the 2016 citywide walkout after the election of Donald Trump, said Laina Cox, Capital City’s middle school principal. “They get it,” Cox said. “The hope is they will hold on to that for the next seven, eight years, and when they’re able to vote, they will, and until then, they will hound their neighbors and their parents and their grandparents and explain to them why it’s so important to vote,” she said.